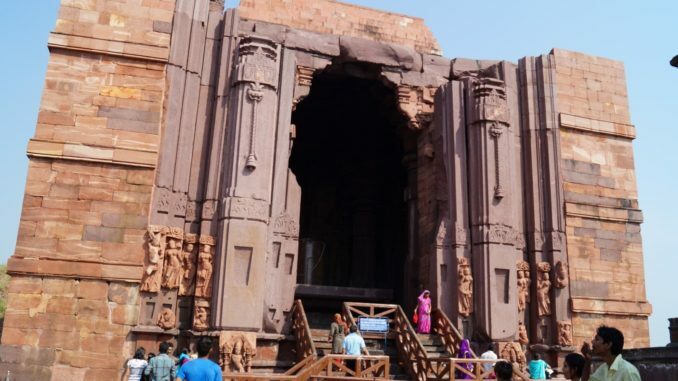 The temple stands magnificently on the right bank of the river Betwa. ancient betarwati, over the rock outcrop . It is about 32 KM southeast of Bhopal. This unique temple but incomplete of for some unknown reason is ascribed to the illustrious King Bhojadeva (1010-1055 A.D.) of Paramara dynasty of central India, who was a great patron of art, architecture and learning. The king Bhojadeva was renowned author who wrote more than eleven books of which Samarangana a treaty on architecture is the most important. Locally, there are several folklores prevailing in this area. According to one folklore this temple was built by the Pandavas during their exile. Some People even claim Kunti had left Karna somewhere here alone the bank of river Betwa. The west-facing lofty temple is raised on a 106 ft long , 77 ft wide and 17 ft high platform. The incomplete roof of the Garbhagraha is supported on four colossal pillars and twelve pilasters rising to a height of 40 ft. The sanctum is are carved with figures of the river goddesses Ganga and Yamuna on either side. The bracket – capitals of four massive pillars of the sanctum are portrayed with figures of Uma-Maheswar, Lakshmi-Narayana, Brahma-Savitri, and Sita-Rama, Externally the temple is bereft of any ornamentation, except on the front facade. The balconies on the three facades although do not have any functional use, breaks the monotony of the plain walls. 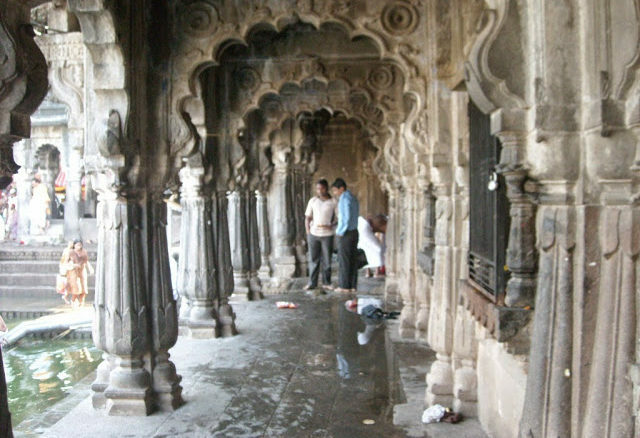 Probably there balconies once accommodated family deities of the Saiva cult which are now scattered around the temple. It is exhilarating to know that Siva Linga with its Yoni Patta rising to height of 22 ft is the tallest and grandest in the world. The huge Yoni patta made of a single block of stone broke into two pieces when a large size stone of the ceiling fell down on it, and thus the temple remained with a broken Yoni patta and the ceiling open to the sky for centuries. But now the Yoni Patta has been meticulously joined together and the opening of the ceiling has been covered with fiber glass sheet decorated with the inverted lotus flower which is exactly alike the original architectural remains of the roof. The temple is survived with a ramp on its bank side which was used for the transportation of large size stones to the raising heights during the temple building. Nowhere else in the world the ancient building technology of lifetime large size of stone architectural members to the top of the structure is extant. The fact that how the builders of the temple raised stone as large as 35x5x5 ft and weighing about 70 tones to the temple top could have remind a mystery had this ramp was not in existence. Again nowhere else detail line drawings of the temple such as plan, elevation, pillars and pilasters, sikhara and kalasa have been engraved as stencil on the rock surface. It speaks that before building, the temple plan and elevation were engraved on the rock. The presence of ramp, engravings on the rock and the grand Siva Linga enshrined the sanctum make it an unsurpassed heritage of mankind. Trimbakeshwar is an ancient Hindu temple in the town of Trimbak, in the Trimbakeshwar tehsil in the Nashik District of Maharashtra.